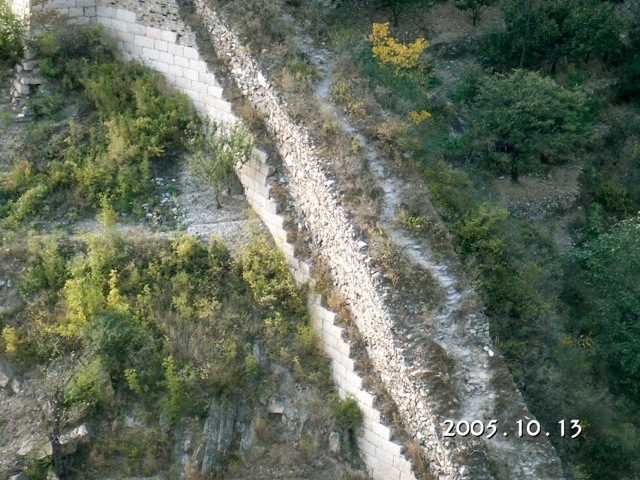 The Great Wall (萬里長城) was an extensive defensive structure. It was first built 2,500 years ago during the Warring States (戰國) period when many states were fighting for supremacy. 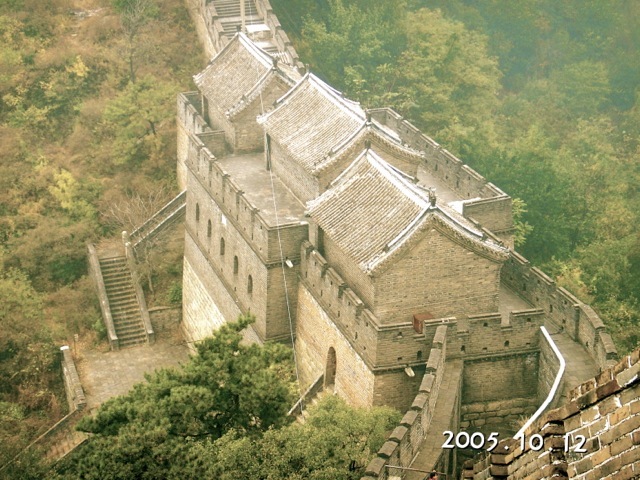 Subsequent dynasties (秦, 漢, 魏, 齊, 隋, 遼, 金, 明) repaired them or built new walls in different locations. The total length is estimated to be 13,000 miles. That’s 1/2 the circumference of the Earth. The Wall generally demarcates the arable from the dry lands. 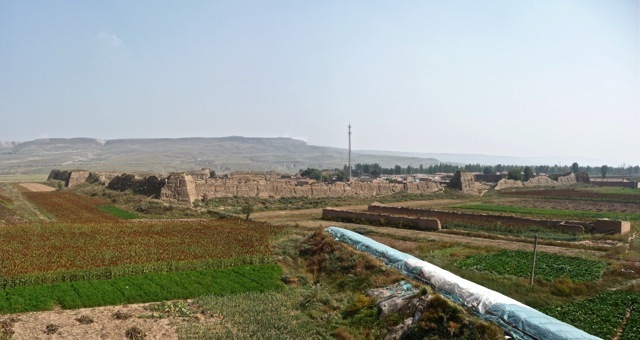 It separated the agricultural Chinese from the herding nomadic tribes including Xiongnu (匈奴), Xianbei (鮮卑), Uyghur (回鶻), Rouran (柔然), Mongol (蒙古) and Manchu (女真) who occupied the northern territories at different times. The Wall was built to defend against frequent invasion by various nomadic tribes. 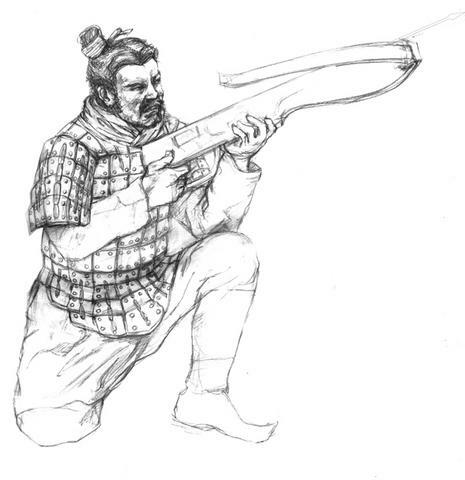 While the Chinese often lacked the mobile calvary of the nomads, they possessed advanced technology including the powerful crossbow and gunpowder weapons. The Wall alone was ineffective without a capable military organization that provided armies, logistics, communication systems, mutual support operations, etc. At one time, 800,000 troops were dedicated to the defense of the Wall during Ming dynasty (明朝, 1368 – 1644). A good combination of early warning sentry towers and rapid beacon tower communications allowed timely reinforcement to reach points of incursion. When this organic system failed in times of civil strife, nomads could breach the Wall. 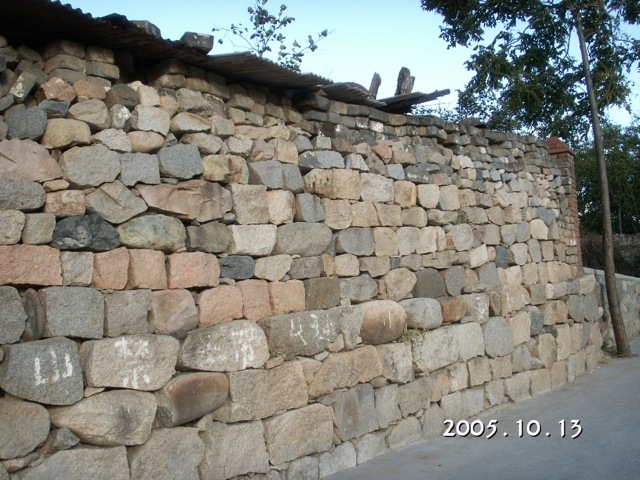 The Wall was built variously with stones, bricks, rammed earth, and rammed composites, depending on available material. 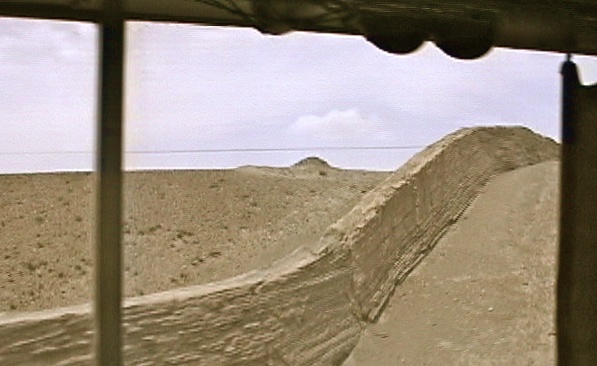 The first continuous Wall was constructed by Qin (秦, 221 – 206 BCE) after it unified China. This relic of the Qin Wall is built with stones. In mountainous area where stones and brick-firing fuel are available, the Wall was built with stone or brick walls filled with rubble. 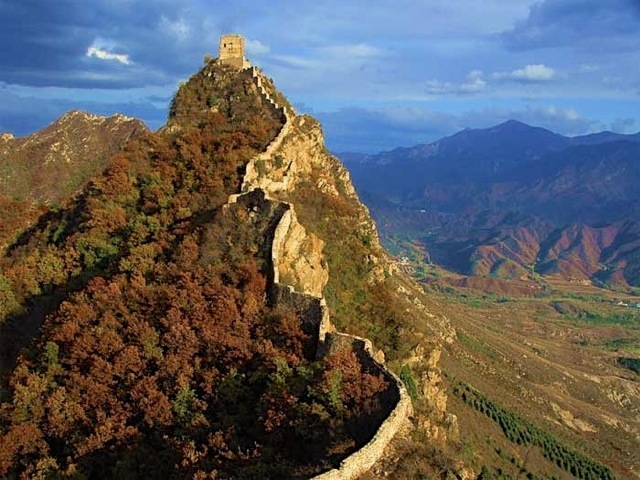 The Wall meanders and climbs over mountains, reaching unbelievable heights in places such as JinShanLing (金山嶺). I did not dare to climb this precarious, narrow wall. I can’t imagine how difficult it was to build. 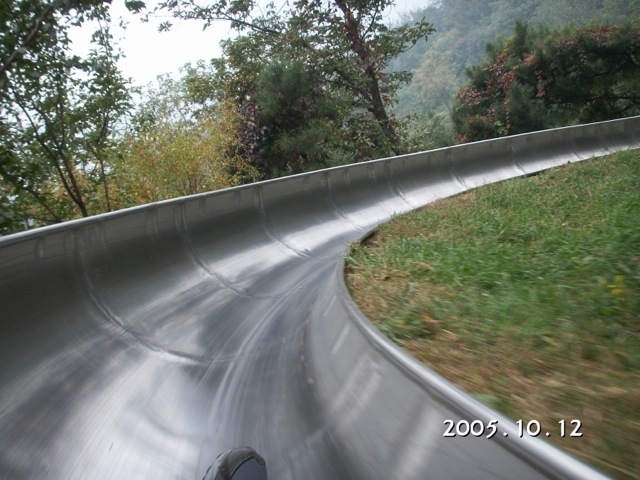 A luge track for wheeled sleds brought me down exhilaratingly fast from the MuTianYu (慕田峪) Wall. 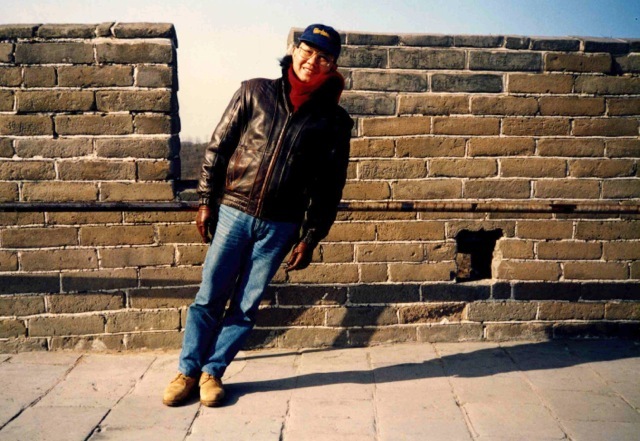 In places, the Wall climbed steep slopes and gave me this photo opp. I don’t understand how wet, slippery mortar held the inclined bricks in place before it set. 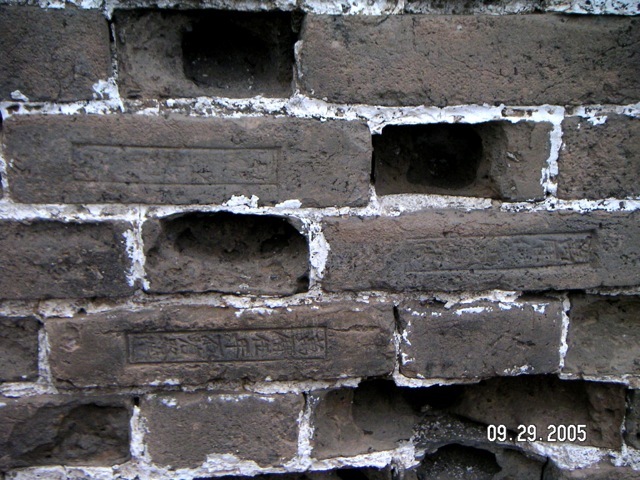 As a quality control measure, some bricks made for the Ming (明, 1368 – 1644) Wall were stamped with the manufacturers’ ID. If any failed, they could be traced to their makers. 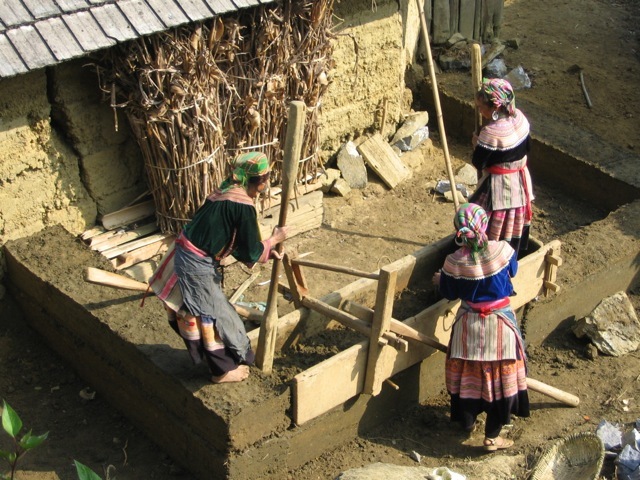 In areas such as ShanXi (山西) and ShaanXi (陝西) where stones and fuel are less readily available, the rammed earth method was employed. As these women demonstrate, damp earth is filled into a mold and compacted until solid. Such construction is surprisingly sturdy as some rammed earth Wall survives many centuries of exposure to rain and frost. 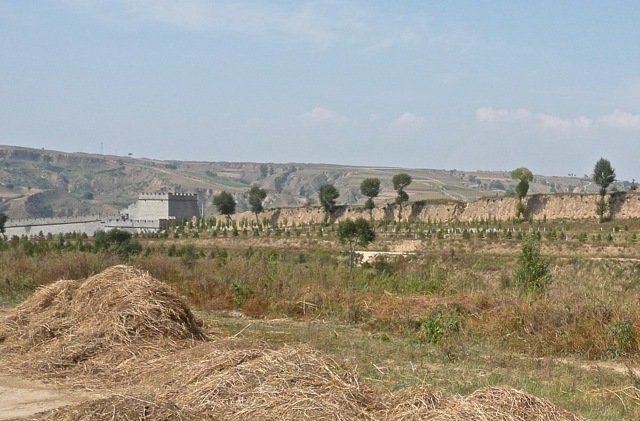 This section of Han (漢, 206 BCE – 220 CE) rammed earth Wall is reconstructed. It would have been an effective barrier to horseback invaders. I walked on top of this old rammed earth wall. Wall towers interspersed as watch towers, communication nodes, shelters, and command posts. 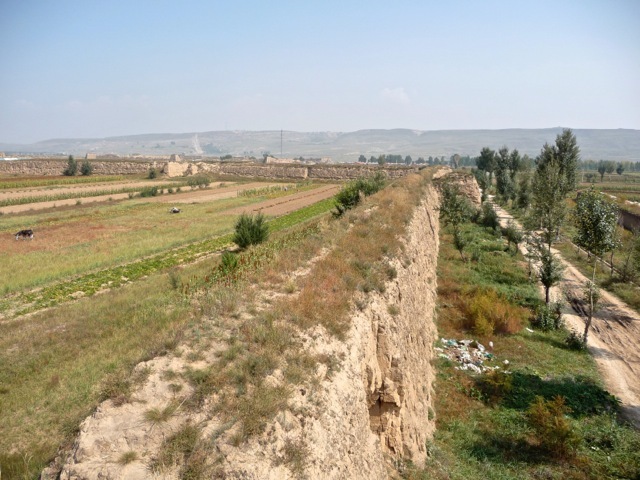 At ShaHuKou (殺虎口), the Qin (秦, 221 – 206 BCE) rammed earth Wall runs parallel to the Ming (明, 1368 – 1644) Wall. In the desert area further west, very little was available to build the Wall with. An ingenious method was developed and the Wall lasted many hundreds of years in the arid climate. Layers of earth and gravel were reinforced with layers of desert brush branches and rammed solid. 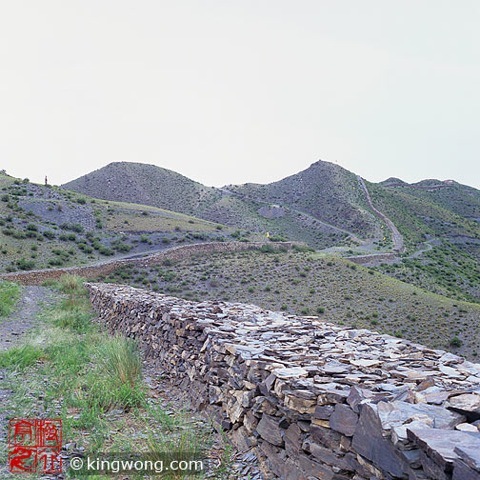 This westernmost section of the Wall in the Gobi (戈壁) desert is near JiaYuGuan Fort(嘉峪關). Military movements require a system of roads. 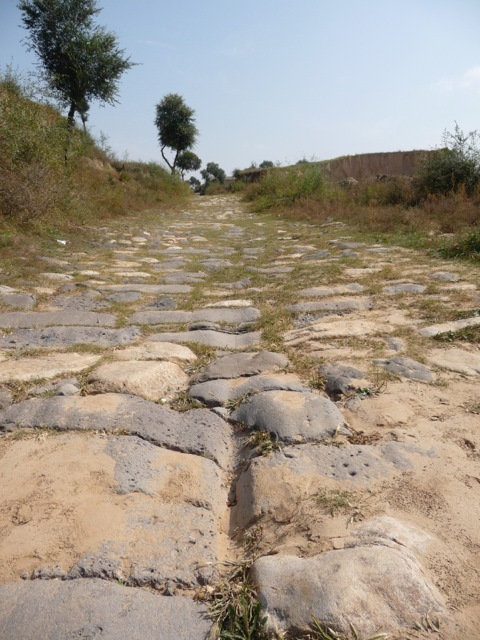 This old, well-worn trading road (晉商古道) in ShanXi (山西) is representative of road systems in ancient China. The Wall served as military roads in mountainous terrain for troop movements. As the surfaces wore down, they were resurfaced with new layers of paving blocks. Passage through the Wall was strictly controlled at guarded gates. This small gate has the belligerant name of Suppress the Captives Gate (鎮虜關). 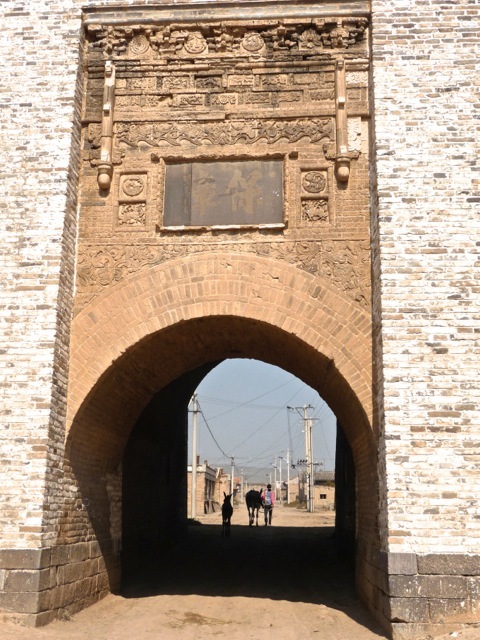 This elaborate gate tower named Central Gate (正關台) was a main gate of MuTianYu (慕田峪) Wall. It was repurposed as an inn by some entrepreneurs for a few years but was deemed inappropriate and closed. I wanted to spend a night there and was disappointed when I arrived and found it closed. 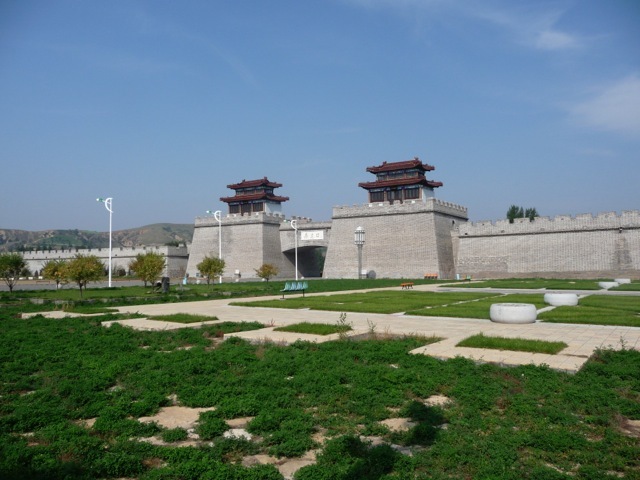 The system of wall, gate/wall towers and watch/beacon towers at Guarded Pass Fort (守口堡) near the city of DaTong (大同) demonstrates the elaborate defense system for an important pass. This double gate relic of a fort’s gate house served to assure security. 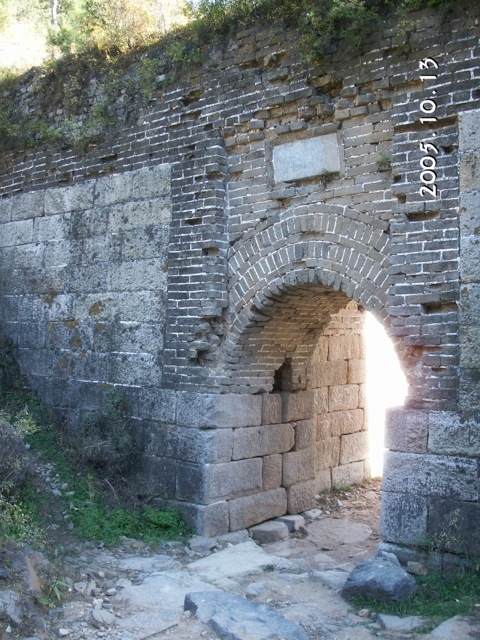 Kill Tiger Gate (殺虎口) was a vulnerable, frequent invasion route through the Wall. The original gate has been replaced by a modern gate straddling a highway. The newly constructed brick-faced wall is incompatible with the original rammed earth Wall. 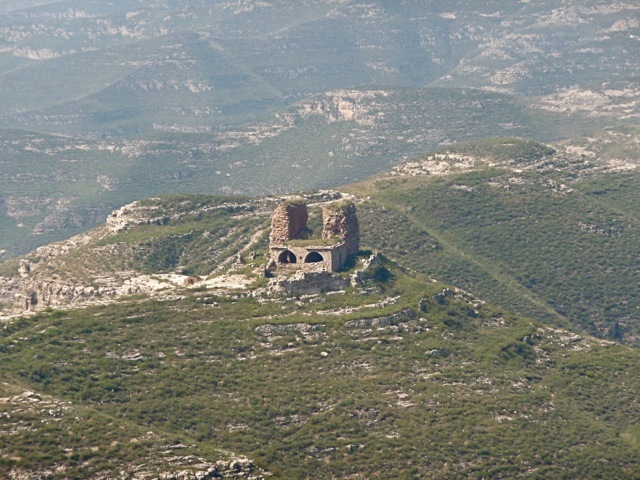 Many stand-alone towers were placed on peaks as part of the defensive infrastructure. Watch towers were placed forward of the Wall as sentry to watch out for incursions. Strings of beacon towers relayed warning messages with smoke in daytime and fire at night to mobilize reinforcement forces. 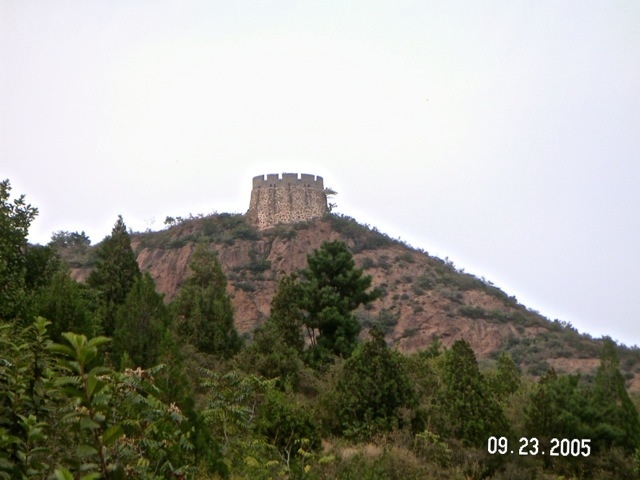 This well-constructed watch tower in JinShanLing (金山嶺) is made of stone. 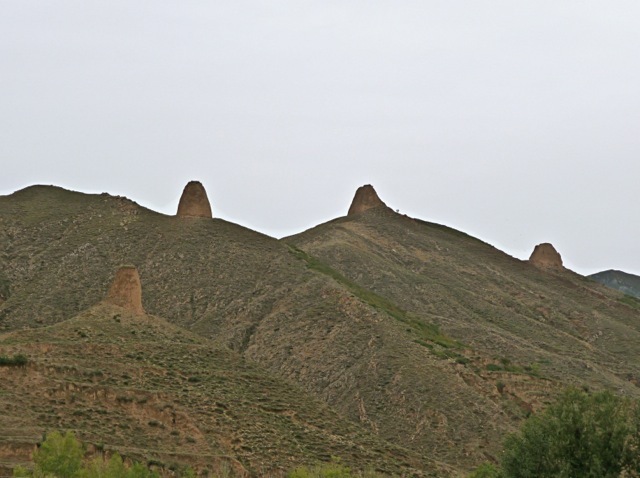 This twin tower sits on a peak near Yellow River (黃河). This forest of towers at Controlled Pass Fort (守口堡) illustrates the elaborate defensive system. 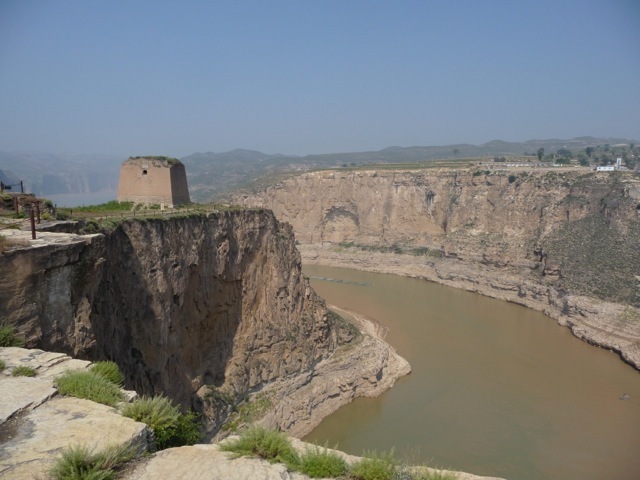 This watch tower above Yellow River (黃河) at LaoNiuWang (老牛灣) was very important in winter months. 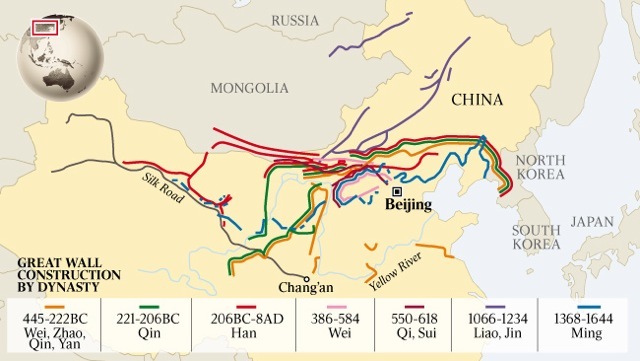 When the river froze, raiders could take the icy highway into China’s interior. Hemmed in by the high banks here, the invaders would eventually reach flat land where they conducted raids. This watch tower could catch the incursion and send early warning messages to activate defensive measures. Forts were built to station large number of troops as reinforcements to incursion points. 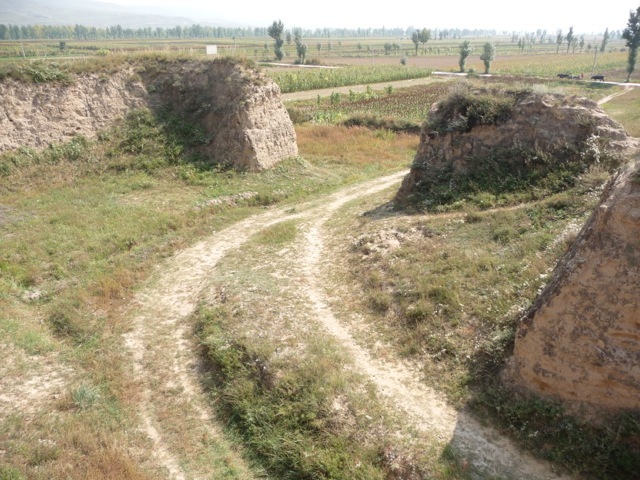 YunGang Fort (雲崗堡) is a relatively intact relic, sealed off from curious tourists and scavengers. It sits right above the cliff face that houses the YunGang Grottoes (雲崗石窟), an UNESCO World Heritage Site. I could only peek at it from a distance through a crack in the enclosure. Suppress Barbarian Fort (鎮羌堡) is situated a few hundred feet from the Wall. Its interior has been turned into productive farm land. 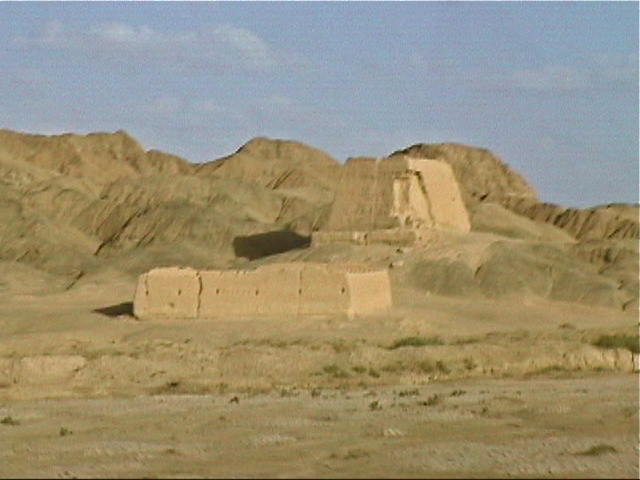 A lonely fort in the Gobi (戈壁) desert of GanSu (甘肅) on the Silk Road (絲綢之路). It is located near SuLa River (疏勒河), one of a few flowing rivers there. 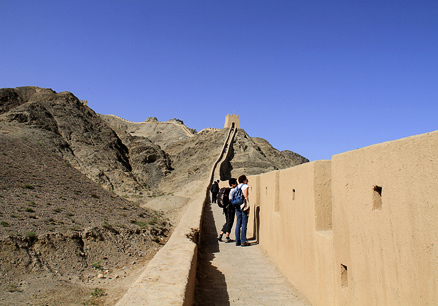 The western terminus of the Great Wall is the JiaYuGuan Fort (嘉峪關) on the Silk Road. 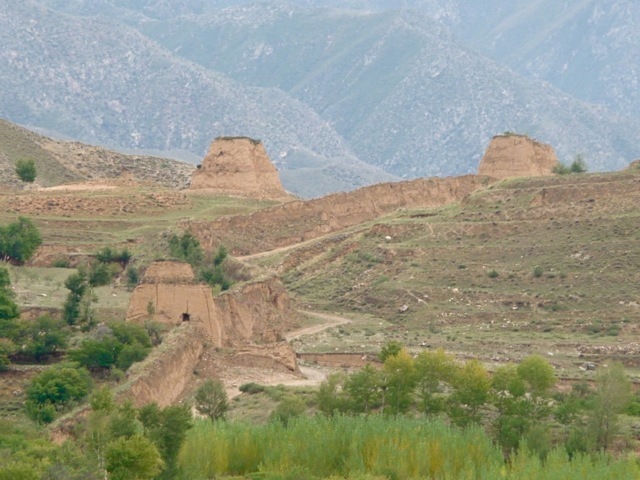 Its impressive architecture in the desolate desert welcomed weary travelers to the rich and sophisticated land of China. 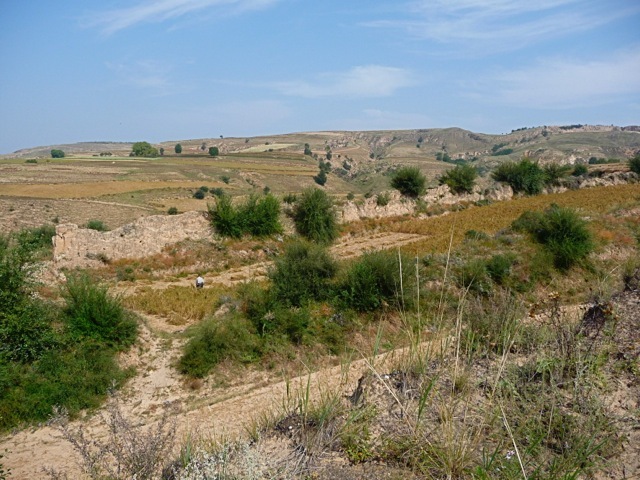 Agricultural China and herding nomadic tribes had complementary needs. Trading towns were established near the Wall to facilitate exchange of goods. Horses and animal products were traded for farmed food, manufactured goods, and luxury items. This Victory Fort Horse Market (得勝堡馬市) was a bustling commercial center. Changed trading methods caused the market’s demise, and it has turned into farm land. This ornate gate of the horse market town reflects the long-lost wealth of the town. Through the centuries, the Wall has been neglected and abused. Its stone facing has been stripped by local people as building material. Both the Great Wall and the Hadrian’s Wall suffered this fate. This farm house in the shadow of the Wall is built partly with stones form the Wall. 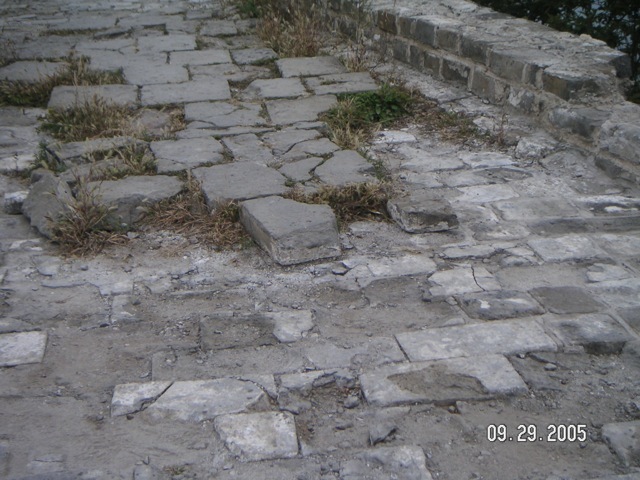 There were government appeals to return the pilfered stones to repair the Wall. The writing on the building prohibits bringing fire-making implements into the hills in order to prevent hill fires. The Wall was maintained periodically for military reasons in the old days, but this is done today to attract tourists. 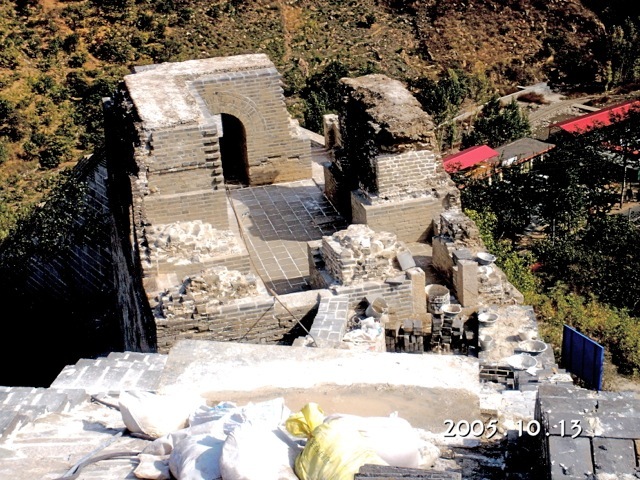 This wall tower at HuangHuaCheng (黄花城) was being repaired with new bricks and paving blocks. This was very labor intensive as all the heavy construction material had to be manually hauled up the mountain. 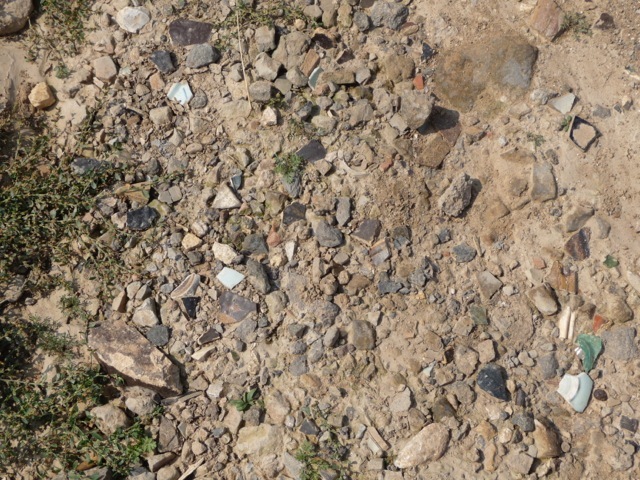 On the grounds of PingJiBao (平集堡), I could see plenty of shards of old pottery and shiny porcelain. 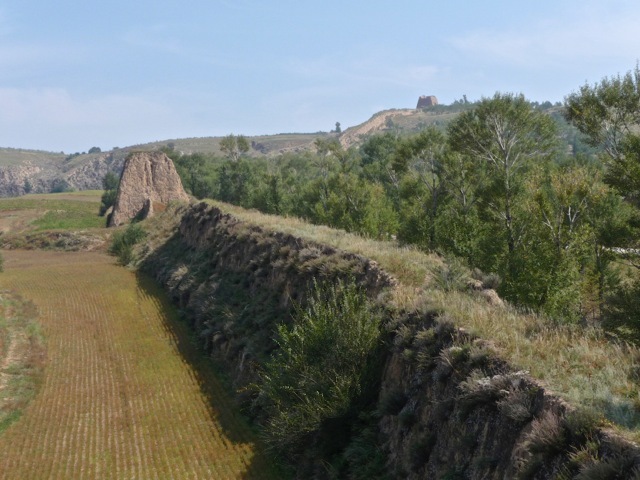 Unlike the Hadrian’s Wall, the Great Wall has not been extensively excavated. This looks like a potentially productive archeological site. Posted by Robert Wu on Sunday, August 31, 2014, at 11:07 pm. Filed under Uncategorized. Tagged 1. Follow any responses to this post with its comments RSS feed. You can post a comment or trackback from your blog.